Select the description of the translation that moved ABCD to A¢B¢C¢D¢. Point A moved 6 units down and 3 to the left. The three vertices moved the same way. Point A moved 5 units down and 2 to the left. The three vertices moved the same way. Point A moved 6 units down and 2 to the left. The three vertices moved the same way. Point A moved 5 units down and 3 to the left. The three vertices moved the same way. Select the description of the translation that moved ABC to A¢B¢C¢. Point A moved 6 units down and 6 to the left. The three vertices moved the same way. Point A moved 6 units down and 7 to the left. The three vertices moved the same way. Point A moved 7 units down and 6 to the left. The three vertices moved the same way. Point A moved 7 units down and 7 to the left. The two vertices moved the same way. 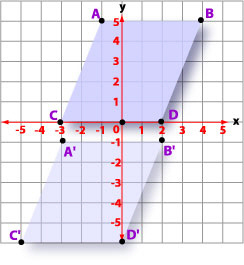 The vertices of square ABCD are A(-5, 4), B(-3, 4), C(-3, -2), and D(-5, 2). Square ABCD is translated 4 cm left and 4 cm down. What are the coordinates for point A¢? What are the coordinates for point B¢? What are the coordinates for point C¢? What are the coordinates for point D¢? DABC is translated 2 units to the right and 3 units down. The vertices of the image triangle, DA¢B¢C¢, have coordinates A¢(-2, -2), B¢(-3, -5), and C¢(-5, -6). 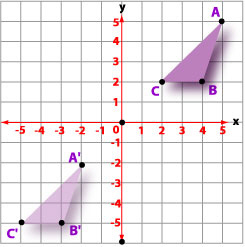 Determine the coordinates of the vertices of DABC. What are the coordinates for point A? What are the coordinates for point B? What are the coordinates for point C?